Our research in the Himalaya is beginning to shed light on these massive processes, and understand the threat they pose to local people. There are a number of factors made this quake a recipe for catastrophe. It was shallow: an estimated 15km below the surface at the quake’s epicentre. It saw a large movement of the earth (a maximum of 3m). And the ruptured part of the fault plane extended under a densely populated area in Kathmandu. But with each new quake researchers are gaining valuable new insights. As exemplified by the ready availability of quality data and analysis in near real time provided by organisations such as the United States Geological Survey and Geoscience Australia, the global network of geophysical monitoring is providing an ever more detailed picture of how the earth beneath or feet is behaving. New techniques are also helping us read the record of past earthquakes with ever greater accuracy. Our research collaboration – involving the University of Melbourne, the Jawaharlal Nehru Centre for Advanced Scientific Research and the Indian Institute of Science in India, the University of Victoria in Canada, and the Bhutan Government – is studying the earthquake geology of adjacent areas of the Himalaya in the state of Uttarakhand in India and in Bhutan. 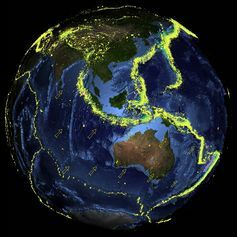 Together we are mapping indicators of tectonic activity that link the earthquake time-scale (from seconds to decades) to the geological time-scale (hundred of thousands to millions of years). Our work in Uttarakhand and elsewhere is revealing how the rupture lengths and magnitude of Himalayan quakes is controlled by long-lived geological structures. While little comfort to those dealing with the aftermath of Saturday’s tragedy, it is part if a growing effort from the international research community to better understand earthquakes and so help mitigate the impact of future events. Funded as part of the Australian Indian Strategic Research Fund and DFAT aid programs, our collaborative work is a reflection of the commitment of our governments to international earthquake research. Mike Sandiford, Professor of Geology and Director of Melbourne Energy Institute at University of Melbourne, receives funding from the Australian Research Council, and has received funding for the research discussed here from the Australian Indian Strategic Research Fund. He supervises a postgraduate student from Bhutan studying the Himalayan earthquake geology supported the DFAT aid program. CP Rajendran, Professor, Geodynamics Unit at Jawaharlal Nehru Centre for Advanced Scientific Research,, does not work for, consult to, own shares in or receive funding from any company or organisation that would benefit from this article, and has no relevant affiliations. Kristin Morell, Assistant Professor, School of Earth and Ocean Sciences at University of Victoria, receives funding Canada’s Natural Sciences and Engineering Research Council (NSERC) for ongoing work in the Himalayas.